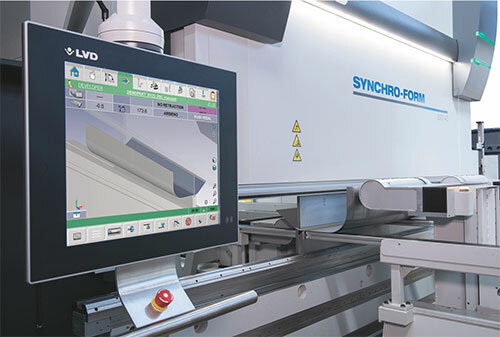 LVD Strippit introduces Synchro-Form, an advancement in adaptive press-brake-bending technology. Synchro-Form automatically maintains angular consistency and the required geometric profile when handling, positioning and bending large parts with multiple bends. The system overcomes the problems of accumulative error and trial-and-error bending when forming large profiles. As a result, Synchro-Form ensures precise, efficient bending, eliminating manual operations and increasing throughput. The system uses a laser scanner and synchro modules (X, R and A-axis magnets) to manipulate, position and measure each bend. It relays the digital information to an LVD Touch-B control, which triggers adjustments to part and ram position to achieve the correct profile. Rather than variations accumulating, they instead are compensated for with each bend step. Even after multiple, consecutive bends, the profile will be perfectly formed, according to company officials. The Synchro-Form system is an integrated feature of the firm’s Synchro-Form series of press brakes in models from 320 tons by 13 ft. to 3000 tons by 46 ft.